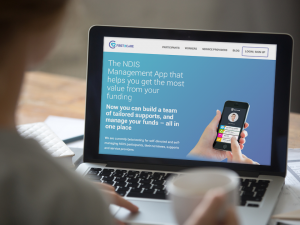 An innovative new self-management app that helps people with disability create customised plans for the National Disability Insurance Scheme has been launched. 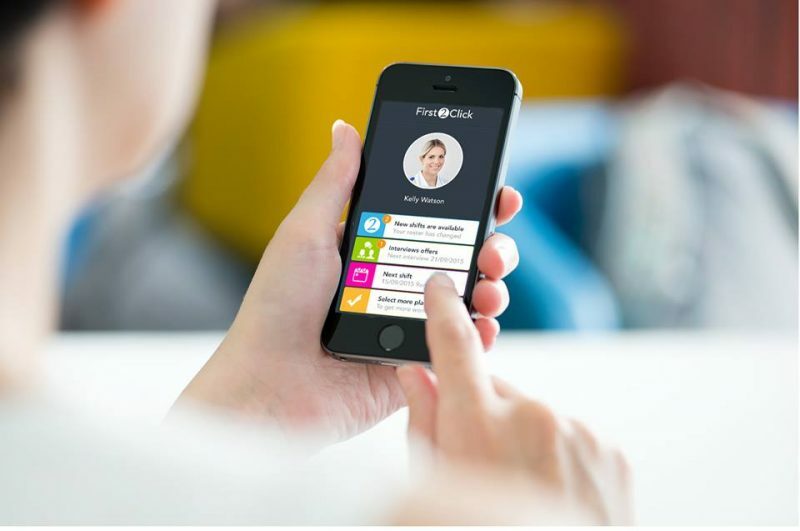 The app First2Care allows members to pre-plan and self manage their NDIS applications both ahead of and after the rollout of the scheme in Queensland. The app was designed by Support Management Solutions and was orchestrated by CEO Andrew Wallace, David Swift and Geoffrey Cooper. 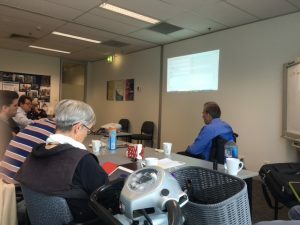 First2Care was first introduced to the Brisbane Queensland Disability Network branch in August. David Swift (pictured left), co-designer of the app and manager of community engagement, said it will effectively remove the middle man by allowing people living with disability to self-manage customizable rosters and select personal care services. Mr Swift uses a wheelchair and has extensive experience in engaging with support services. “I used to have a whole team that managed my rostering, this app gives you a level of control over your own schedule and support services,” Mr Swift said. “It’s technology that is going to be for the NDIS landscape and goes into details like individual carers and being able to manage them online. Mr Swift said there is another way the app can be utilised. “It’s specifically designed for a self-management situation where people can manage their own funds, but it can also be used for self-direction,” Mr Swift said. First2Care CEO, Andrew Wallace said self-direction allows people to elect a representative to assist in the management process. 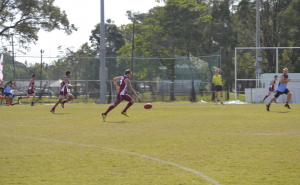 “Self-directed is a little different in that you may want someone to manage the rostering for you and provide support, so you may elect someone else to manage your rosters and staffing on your behalf,” Mr Wallace said. “You may request help with the financial side of managing the plan, such as invoicing. You don’t have to self-manage every aspect, you can engage with support. Mr Wallace said the app has a high level of direct communication between the user, support services and the NDIS. “Our pre-planning platform is based on the NDIS documentation, the output is essentially the same as the initial planning document… it can be shared directly with the NDIS via the platform,” he said. Support workers will have a version of the app that allows them to communicate with the user. “Workers will have a mobile phone app where they will receive the rostering information telling them when they need to come to work, they can also send you notifications if they can’t attend a shift via the mobile app,” Mr Wallace said. Family and friends can also get involved via invitation. “You can connect with your family, friends and support carers by inviting them to assist in the pre-planning process,” he said. Co-designer and social/support worker, Geoff Cooper said the app is unique in that its co-design was structured based on lived experiences. Mr Cooper was directly involved in making the app accessible for people living with vision impairment using speech-to-text technology. He has been legally blind since he was 30 years old. 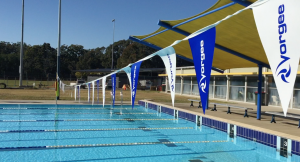 “We have put a lot of input in from people with disability, it’s truly consultative of the people that are going to use the technology,” Mr Cooper said. “I wanted to make sure it was accessible so I wanted to be involved in the process… it is centered on the person receiving support. Mr Cooper said the app will not only help him, but will also benefit other people living with disabilities. “I want to continue to assist other people with disability to make successful applications to the NDIS in order to attract appropriate support that will enable them to live the life they have a right to live,” Mr Cooper said. “I believe First2Care will assist me and the people I support to track progress of goals qualitatively and [equip] funding accurately. The concept of the app began two years ago. It has been in beta-testing for the past year. The final product allows people to build a profile and create goals which assist in selecting their support. Mr Wallace (pictured left) talked through the process with Brisbane members of the Queenslanders with Disability Network (QDN). “The first step is to build a personal daily profile of your activity and interests,” Mr Wallace said. “You define your life now with a series of questions like what are your education, work and social activities, what things are working well, what things would you like to change, something new you would like to try, things that I am good at. These are all questions the NDIS will ask you. The “My Life Now” section allows users to build a personal profile. First2Care is registered and approved by the NDIS. “The software is registered with NDIS as a plan management provider, and also a communication equipment assistant technology,” Mr Wallace said. “As long as you have internet access the app will be available on multiple platforms, including mobile and tablet. In terms of the cost of the other services of the app, Mr Swift said the price had not yet been finalised. “The pre-planning is free and we’re talking about roughly $30 a month for access to the app but this may change in the future,” Mr Swift said. 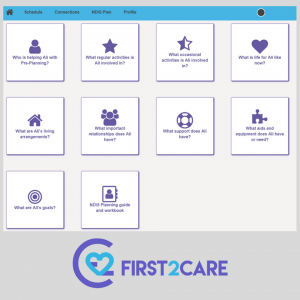 For further information on the app, head to their website (http://first2care.com.au) or Facebook page (https://www.facebook.com/first2careAUS/).